it’s made by Simmons and exclusive to their Beautyrest mattress collections. Pocketed Coil springs, an innovation developed by Simmons, are the secret to undisturbed and comfortable sleep. Unlike the wire-tied springs in ordinary mattresses, Pocketed Coil® springs are not joined at the top or the bottom. Instead, high carbon steel springs are pre-compressed and placed in durable, non-allergenic fabric encasements. This allows the Super Pocketed Coil® springs to adjust individually to the weight and contour of your body. Since adjacent springs aren’t tied together, there’s no chain reaction of movement when you turn or move during the night, leaving you both undisturbed. You and your partner can toss and turn some 40-50 times a night; so you can see why motion separation is a key to peaceful undisturbed sleep. Beautyrest’s original Super Pocketed Coil® spring unit virtually eliminates motion transfer, making it the perfect bed for couples. When you move, the Pocketed Coil® springs go to work, cushioning and supporting your body at every turn, so you sleep peacefully and undisturbed. In fact, all you’ll feel is rested™. Think of the best massage you’ve ever had. Now you can see how the Pocketed Coil® springs go to work on your body, cushioning you, and supporting you. Wrapped in soft yet strong fabric, they work independently, conforming to the exact shape of your body. Every time you move, the Pocketed Coil® springs instantly respond and move with you. 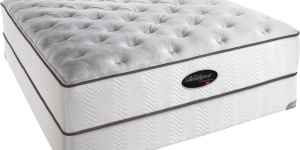 Combine this superior conformability with the cushioning properties of visco memory foam or latex foams available in some models and you have a mattress that provides the ideal combination of comfort and support. The Beautyrest Classic collection features 800 individually pocketed coil for a contouring support like no other. Some models include pressure relieving memory foam. The Beautyrest Anniversary Collection celebrates the long standing history of the Beautyrest brand. 850 Individually pocketed coils encased in a 360 degree perimeter foam encasement. The Beautyrest World Class Collection pairs 1000 Individually pocketed coil with the finest comfort layers available today. NxG Next Generation Memory Foam and cool sleeping, forgiving Latex. 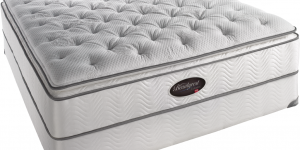 The New Simmons Beautyrest Collection is on display now at Mattresses & More. You may call 636 928 6218 For directions or details. Rebates can be applied to more than one Simmons mattress purchased during the promotion timeframe. All Simmons mattresses are eligible. Rebate forms will be emailed to you should you win. Then simply complete and mail with your original receipt. Enter to win daily. Remember, over 20,000 will win. That’s up to 3,000 weekly winners! And don’t fret if you’re not a winner. You’ll still be automatically entered to win a weekly rebate of $5,000! No purchase necessary. Void where prohibited. Standard data and text messaging rates apply. 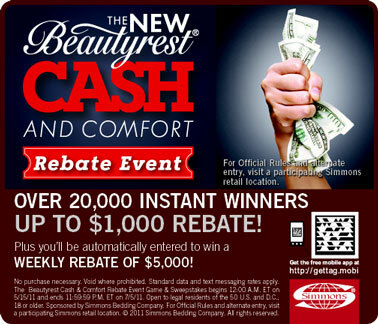 The BeautyrestÃ† Cash & Comfort Rebate Event Game & Sweepstakes begins 12:00 A.M. ET on 5/15/11 and ends 11:59:59 P.M. ET on 7/5/11. Open to legal residents of the 50 U.S. and D.C., 18 or older. Official Rules, Terms and Conditions.